After five seasons, one of the most celebrated stories in television history has been brought to its conclusion. Were you one of the many who followed it obsessively? Come on down on the 6th of November for a Trivia Like none other! 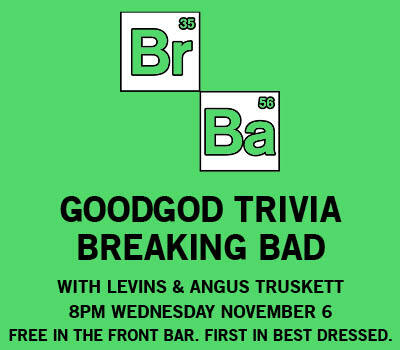 Hosted by a different kind of cook, Andrew Levins and Angus Truskett, they’re gonna test your knowledge on everything Breaking Bad. No bookings taken, but there’s plenty of room, so make sure you drive your Winnebagos down nice and early to save yourself a prime table!